The textbook for Philosophy 101, "Ethics, Economy and Entrepreneurship." The Tucson Unified School District has postponed the public review of a textbook from a controversial economics course after authors of the book refused to allow digital access for the public. 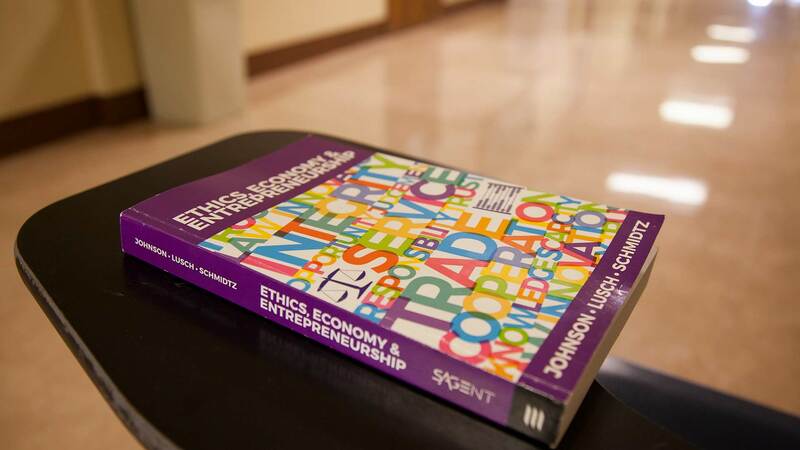 The textbook, "Ethics, Economy and Entrepreneurship" was the centerpiece of Philosophy 101, a course that fulfilled the economics requirements for high school graduation in TUSD. The course was pulled from the district last year after it found both the course and book hadn't satisfied requirements of the district's vetting process. Giving the course a fair shot at coming back into the district, TUSD decided to allow the textbook to undergo a 60-day public review process. Traditionally, textbooks are available digitally for online access to the public during the review process. The district has postponed the public review after authors of the textbook — Cathleen Johnson, Robert Lusch and David Schmidtz — refused to allow the book to be made available on a digital platform, Superintendent Gabriel Trujillo said. "They have insisted on hard copy only," he said. Since the authors do not want an online textbook available, the district will have to formulate a textbook review committee, according to district policy. "The goal is a neutral body that includes a content specialist to review the text in its entirety, and then make direct recommendations to the governing board," Trujillo said. The committee will be made up of the general public and a content specialist that is neutral with regards to the textbook. It will exclude teachers who have taught the course and any party that is affiliated with the publisher or authorship or has direct advocacy for the textbook. TUSD has not set a timeline for when the committee is to be formed. Once it is formed, the 60-day review process will begin for the textbook according to the superintendent. Anyone can review a hard copy of the text at the Lee Instructional Resource Center. Many community members have expressed opposition to the course due to its affiliation with the University of Arizona's Center for Philosophy of Freedom. Otherwise known as the freedom center which was partially funded by Charles Koch. The Koch family has funded a number of conservative political campaigns and is considered influential in shaping conservative messaging. Kochs Off Campus, a local activist group that fights to keep Koch brothers funding away from public education, claims the funding from Koch advocates for a right-wing political agenda.